Long time readers will recall that I have used gastrique as an ingredient before. And indeed, there is only so much you can do with gastrique. It is a bold, full-spectrum flavor that easily overwhelms other ingredients. It needs very little modification to taste complete. I had a shrub-based drink at Canon in Seattle, and I’m not exactly sure how it was formulated, but it inspired me to revisit vinegar drinks. I used a similar gastrique recipe as before, but this time I used strawberry puree instead of smashed blueberries. I fortified the caramel, apple cider vinegar, and strawberry sauce with a little balsamic vinegar for complexity. I tried mixing it as a sour, using lemon juice, but I found the flavor to be a little one-dimensional. As luck would have it, I had a bottle of cocchi americano that was just slightly past its prime. Vermouth acquires a bit of a vinegar tang when it has been open for too long, but since I was already using a vinegar ingredient, I figured I didn’t have much to lose. It turns out, slightly off vermouth goes very well with gastrique. Hard shake over ice and double strain into a coupe. 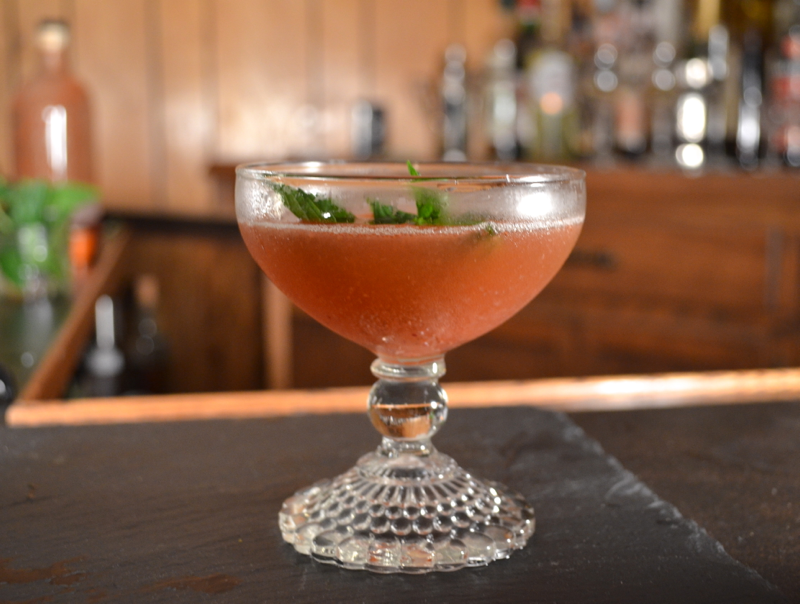 Garnish with a smacked mint sprig. Making bitters at home is pretty easy. If you have a bittering agent such as gentian or angelica root, you can steep 1 teaspoon of gentian root in a high-proof, neutral grain spirit for about 20 minutes to form a bitter base, which can then be infused at your leisure with other flavors. Wrap the reagents in a cheese cloth or other porous wrapper and steep them in the everclear for half an hour. Strain the reagents into 2 oz of water and simmer them in a small pot with the sugar, until the flavors are fully extracted and integrated. Combine the syrup with the infusion of everclear and dispense with an eyedropper. This drink is named after a line from Busta Rhymes’ hymn to the female posterior, #Twerkit. The flavor of this drink leads with cardamom and strawberry, with a base note of bourbon and a finish from the vinegar and vermouth. I hope you find it to be refreshing. Categories: modern drinks, original creations, Uncategorized | Tags: alcohol, balsamic, bartending, bitters, booze, bourbon, cardamom, cocchi americano, cocktail, cocktails, craft bartending, craft cocktails, drinking, drinks, gastrique, liquor, mixed drinks, mixology, spirits, strawberry, vermouth, vinegar | Permalink.